I jog or go to the gym regularly and like to listen to music when I workout to keep me motivated. The main two annoyances when I go for a run is where to put my keys and phone as I don’t always have pockets in my workout clothes, and when they are getting a bit loose they can cause my trousers to feel like they are going to fall down! 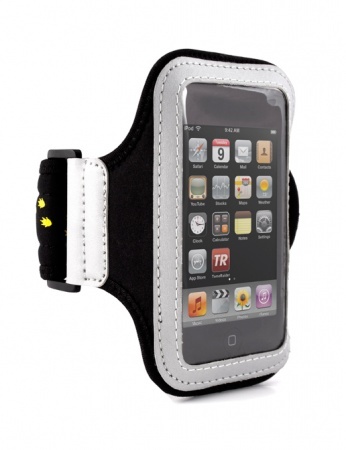 Luckily Proporta sent me out this Apple iPhone 4 – Proporta Sports Armband*. I have to admit I am very happy with it. I liked that there is a key pocket on the back of the armband and although I was initially concerned that the keys were going to fall out because of the way the pocket faced they were fine there. The case is made out of elasticated neoprene, which means it can be washed by hand and it is water, or more likely sweat resistant. This means not only does it protect your phone from bumps and scratches but also unexpected rain, or if you are an idiot like me, water you pour over your head to cool yourself down. The armband is adjustable so it’ll keep up with my weight loss which I think is very important. You can also use the phone through the cover, which to be honest I was surprised at as the plastic is quite thick. Overall I think this case is a winner and will definitely be using it from now on! The good thing about Proporta products is that they have a Lifetime warranty so if it breaks or the elastic is faulty, you can just contact them and they will replace it.